Those words, simple, tore into my heart and made me go to the bathroom and sob. I was failing. To be honest, we had not had school all week – and it was Wednesday. We had “reviewed” by listening to educational songs. We watched a few educational DVDs. But I was in a rut. I could not bring myself to do school. It wasn’t just the schooling. Chick-fil-A and the Mexican restaurant had seen us a few times this week. I had made dinner one time – and the crock pot was still soaking. I was two days behind in laundry. I was still in my PJ’s. I was watching TV. I was in a total Mommy rut. Maybe you have been there too. Maybe you have joined me in this deep rut. Each day, you tell yourself that tomorrow will be better. Tomorrow, you will exercise again. Tomorrow, you will catch up on chores. Tomorrow you will do school. Tomorrow you will be the fun mom – and the romantic wife. Tomorrow. Tomorrow doesn’t come though. It just feels like a little nap before another day that looks just like the day before. For me, it was those tears. There is healing in tears. There is release and letting go in that moment. When we finally break – God can rebuild. I needed my pieces to be thrown on the floor. Eight words shook me to my core. It wasn’t the words themselves, but the fact that my seven year old knew I was in a rut. I wasn’t hiding from her anymore. She knew the truth. In her simple way, she was asking if we were going to get back to normal. I wanted to answer her- but I didn’t have an answer. So, I sat in the bathroom and cried. For the first time in a while, I let myself be okay with the fact that I wasn’t doing this Motherhood thing perfect. That I was struggling. I cried – not just to myself, but to the Lord. Sometimes, he has to make us weak. We have to have days – maybe even weeks – where we sit in the chair and do just enough to get by. Where we don’t cook gourmet meals or get everything done. We get to this place because when we were doing it all, and when we are in that place, we are often doing it in our own strength. Our strength only leads us to our weakness. When we are weak, we look back to the true source of our strength – and that is the Lord. 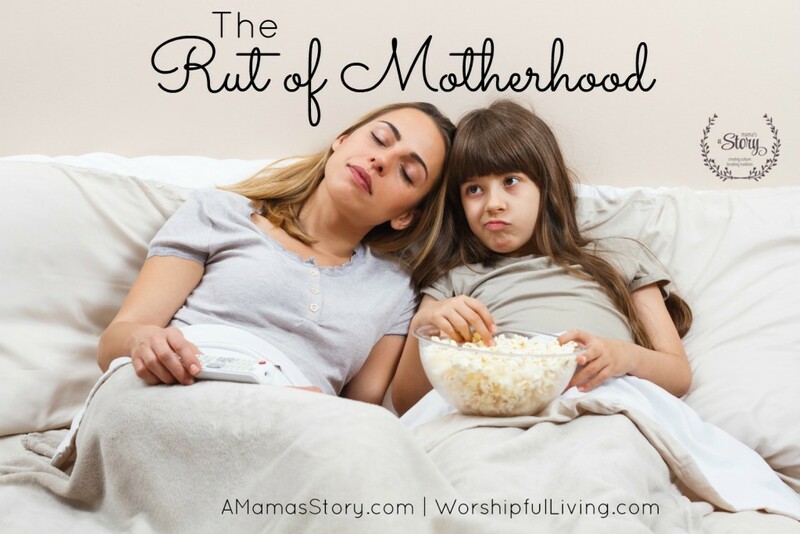 We can’t do this motherhood thing on our own. Only through the power of Christ. If you are finding yourself weak and worn, go ahead and let yourself get to that breaking point. Cry it out before the Lord. Be totally vulnerable before Him. Then, allow Him to be Your strength – and allow Him to give you the grace you need to do this motherhood well. I really needed to hear this. I’m in that rut and every night I go to bed and say that tomorrow will be different and then it isn’t. Thanks for letting me know I’m not alone. Staying at home is just relaxing enough that you can put off everything but busy enough that I don’t get anything done. What a very powerful message! It can be so easy to stop putting God first and center because there is just so much to do. I pray you get back to where you need to be and get out of this rut. So true. I need God’s help all the time! I am in a rut now and I needed to see that I am not alone. Thank you for sharing such a vulnerable moment. I have been there for longer than I would like to admit! Glad to know I’m not alone. Happy to say I am starting to emerge, due to God answering my cries.